We offer broad collection of very high quality to our most reputed clientele. These sets are offered at very reasonable market price. We are the Exporter of Copper & Stainless steel Kitchenware. These can also be customzed as per your specifications. These Copper & Stainless steel kadai's can be made in 13/17/20/25 cm with Lid. Despite copper being a traditional material, there is also a high tech generation of copper pots available. It is medicinally prroved that Pur Copper utensils are good for cooking. These are Karahis with Brass handles. One is shallow and other is deep. This is perfect combination for cooking needs. In line with clients' diverse requirements across the country, we are offering an enormous range of Copper Steel Karahi. 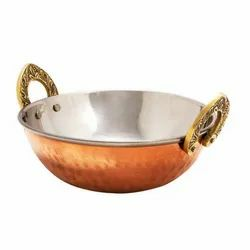 Serving Bowl Karahi Kadai Pan Hammered Copper Serveware Accessories. Another variety that we bring to our esteemed buyers is Copper Steel Kadhai! High quality, sturdy built, fine finish and optimum strength make our Copper Steel Kadhai different from other’s one. We are reckoned as Manufacturer, Exporter and Supplier of Copper Steel Kadhai in Delhi, India. Buyers can get it in tailored specifications and that too at economical prices. we are offering Copper Kadai to clients. Copper Kadai ideally suited for cooking purposes and preparation of delicious recipes. These products are extensively used in domestic as well as commercial kitchens. Our all copper utensils are made using latest designing and mould technolo. We are looking for queries from Foreign countries also.